You can also order the book on amazon. In today’s competitive environment, every dollar spent needs to be tightly tied to the bottom line: a company’s overall profitability. 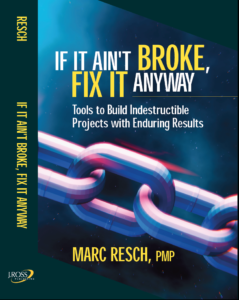 It’s become very clear that project change initiatives are strategic investments, and a project that makes money for the company or ensures value continuity is a good investment, and one that doesn’t is a bad one. Achieving business value is first and foremost to everything we do. We achieve and celebrate ‘Quick Hits’ and build incremental business value that endures for the long haul, thus improving companies’ competitive positioning in the marketplace. We work closely with business leaders and project teams to ensure the quantitative business goals and strategic elements are clearly understood and internalized in order to set our change initiatives up for success from the very beginning. Give us a call at 201-803-4653 to find out more or simply fill out our contact form and we will be in touch with you. Give us a call at 201-803-4653 or fill out our online form to find out how we can help you with your improvement initiatives and how we can deliver in-house LEAN training to your management and staff. Effective project management that utilizes the most optimal business improvement tools is paramount to ensuring that our strategic investments are generating their intended results. There is always room for improvement. Our projects are constantly ripe for fixing, adjusting, and enhancing along the entire life cycle. This insightful workshop will teach you how to be business-savvy strategic thinkers and planners, strong and practical project managers and leaders, and effective change agents focused on the bottom line. Read more! Most of us have heard of the terms discounting, WACC, ROI, NPV, IRR and payback, but what do they really mean, what do they entail and how do we apply them to our projects to determine and drive business value? As project professionals, we must not be intimidated by the numbers, but must understand and embrace them to accurately represent and manage our project investments. Read more! Learn how to deliver perfect value to your customers by eliminating waste along entire value streams, thereby reducing costs and optimizing resource effectiveness. Lean applies to every business and every process. Eliminating waste along entire value streams creates processes that need less human effort, less capital, and less time to make products and services at far less cost. This workshop gives you the essential skills needed to design and deploy efficient, value-based processes within your organization, your department and even your projects. Find out more!